If so, let me set the record straight. 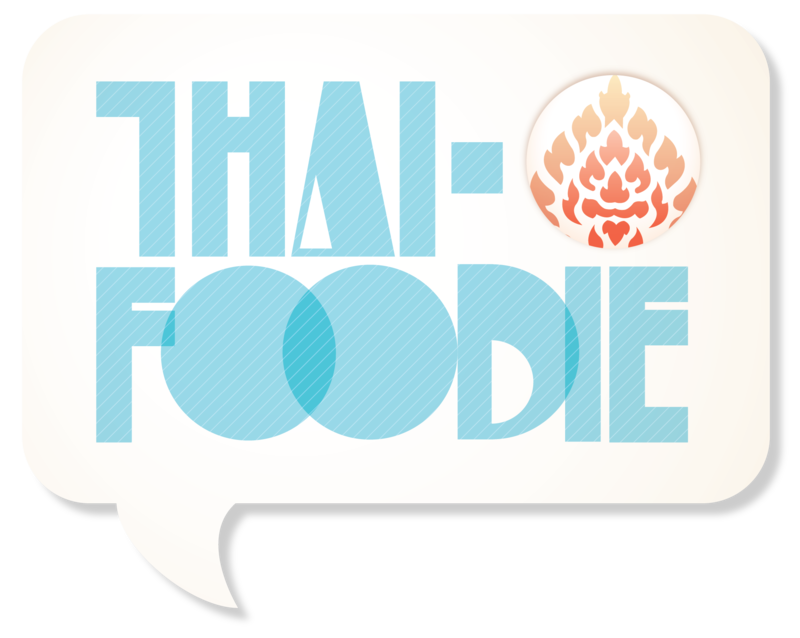 Out of around 302 billion Thai dishes in the world, only ONE dish eaten in Thailand has a Thai peanut sauce!! 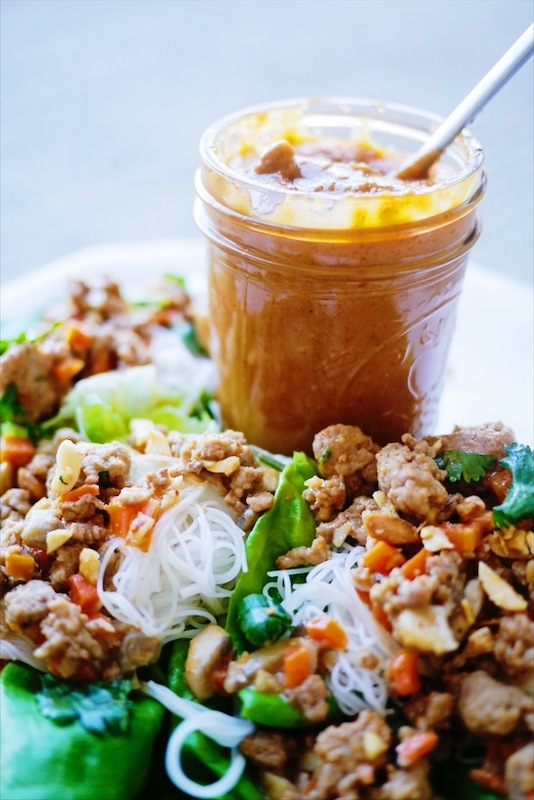 So how did Thai food and peanut sauce become synonymous in America?? I don’t know for sure, but my guess is that we Americans love our peanut butter (what’s not to love?! ), so once Thai Pork Satay with Thai Peanut Sauce arrived (which is the one dish that has a Thai Peanut Sauce in Thailand), we pounced on it, and adored it, and told everyone we knew that Thai food is amazing because it has peanut sauces on everything!!! Let’s make peanut sauce now! Thai food is amazing, and Thai Peanut Satay Sauce is also amazing, but Thai food goes way beyond a good Thai peanut sauce, check out the rest of the Thai recipes on my blog if you need evidence ;). My Thai Peanut Sauce is based off of the kind you might find on the streets of Thailand. That means it’s made of creamy coconut milk, spicy red curry paste, sweet palm sugar and tangy tamarind paste, and normally is served with Thai pork satay. Feel free to use it on whatever you want though because who doesn’t love a good Thai peanut sauce? Especially if it’s legit! 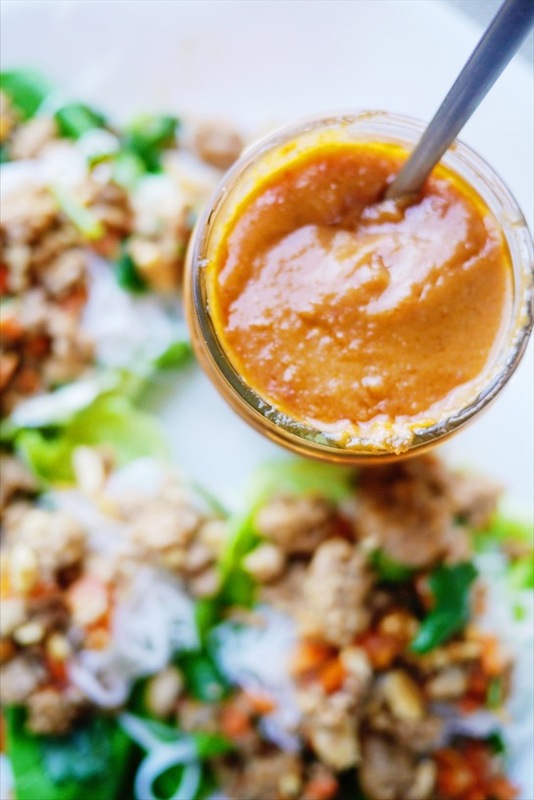 Plus this is a gluten-free, dairy-free, vegan Thai peanut sauce! Yay! whatever you can imagine! Share in comments please! Try it today, and share it with me on Instagram, @thaifoodie! I want to see! 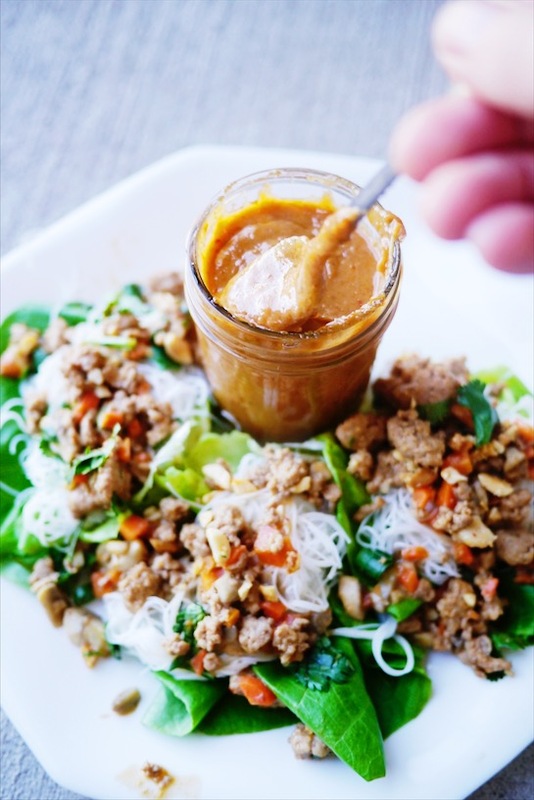 Have you ever had legit Thai peanut sauce? Now's your chance to make it at home with this easy recipe. So jam-packed with flavor: coconut milk, Thai red curry paste, and roasted peanuts! 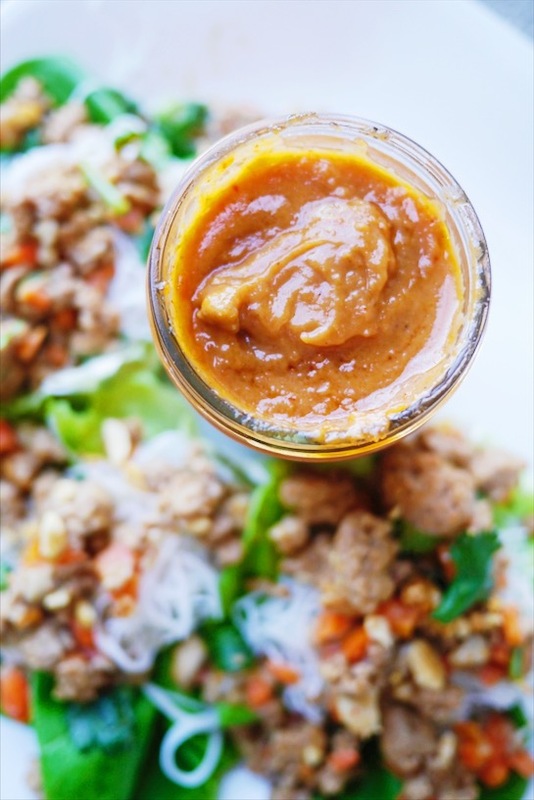 Plus it's a gluten-free, dairy-free, vegan Thai peanut sauce! Perfection! In a medium saucepan, combine the Thai red curry paste and the top layer of coconut cream from the can, (there should be about 2 tablespoons or so of cream) over medium heat. Stir until the paste is incorporated, and it starts to smell amazing, about 1-2 minutes. Add the peanut butter and the rest of coconut milk, and whisk until the mixture starts to thicken, 3-4 minutes. Raise the heat to medium-high, and add the sugar, vinegar (or tamarind if using) and water. Simmer while continuing to whisk it for a few minutes, until sugar is dissolved and it's thickened to your liking, and turn off the heat. Add salt to taste, and more sugar if you want it sweeter (but if you add more sugar make sure you dissolve it before turning off the heat). 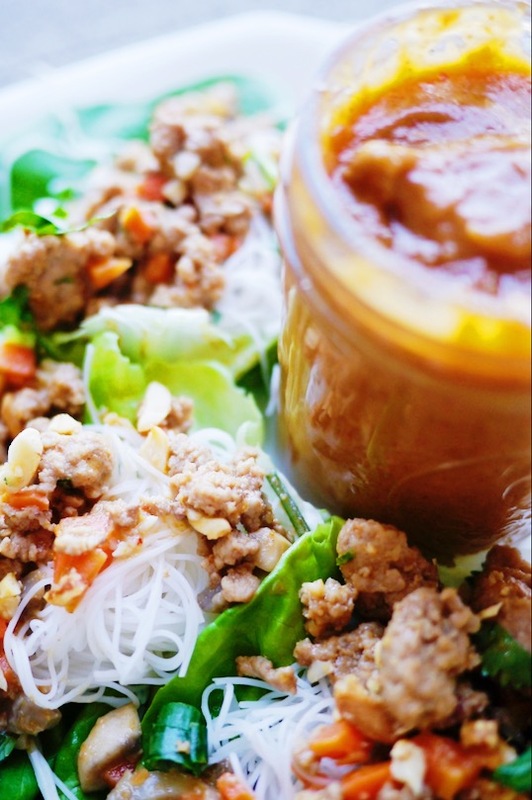 Thai Peanut Sauce can be refrigerated for 2-3 weeks, or put in the freezer for 3-4 months. It usually thickens over time, so I recommend warming it on the stove, and adding a few tablespoons of water to help thin it out some. Satay is also the only thing I’ve ever seen with peanut sauce. Nice read.